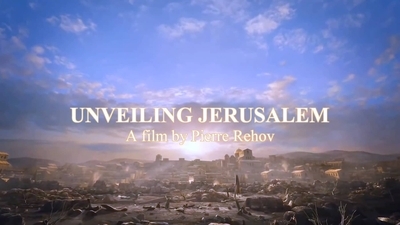 Pierre Rehov's beautiful new film, "Unveiling Jerusalem," shines a spotlight on the city's architectural wonders and amazing recent archaeological finds. Even more importantly, it exposes why the religious-political conflict over Jerusalem appears to be getting worse instead of better despite years of "peace process." It provides much-needed moral clarity on what causes violence between Israelis and Palestinians. Rehov's starting point is the Oct. 13, 2016 UNESCO resolution denying any connection between the Temple Mount and Judaism. The resolution never once refers to the Temple Mount, but refers to the place 19 times by its Muslim name, Al-Haram al-Sharif. Likewise, it refers to the Al-Aqsa Mosque 19 times. "Unveiling Jerusalem" earns its name by offering viewers a glimpse of new archaeological findings and animated reconstructions of the Temple Mount, as well as rare shots inside the stunning Dome of the Rock and Al-Aqsa Mosque. Rehov interviews historians, archaeologists, an Orthodox priest, a Protestant minister, and a Palestinian Muslim human rights campaigner; and adds excerpts from extant writings of Josephus and Tacitus. All confirm the historical as well as religious importance of Jerusalem and the Temple Mount to Christian as well as Jewish history. By denying the connection between the Temple Mount and the First and Second Temples, the latter being where Jesus reportedly spent some of his final hours, Rehov shows, the Arabs who sponsored the resolution also denied Christian ties to Jerusalem. The movie notes that most European (i.e., Christian) nations abstained from the 2016 vote. This denial is a new phenomenon. Rehov documents that pre-1967, Arabs freely acknowledged that the Haram al-Sharif was in fact the Temple Mount. He shows a stone inscription dated to the ninth or tenth century C.E., from an Arab village of Nuba (about 16 miles south of Jerusalem), refers to the Dome of the Rock as "the rock of the Bayt al-Maqdis," i.e., the Holy Temple. He films a 1930 document, A Brief Guide to Al-Haram Al-Sharif, published by the Supreme Muslim Council – led by the anti-Semitic Nazi collaborator, Hajj Amin al-Husseini – states, "Its [the Haram's] identity with the site of Solomon's Temple is beyond dispute." He also shows a 1962 guidebook to the West Bank, published when Jordan controlled East Jerusalem. It identifies the Temple Mount as Mount Moriah, the site of Abraham's near-sacrifice of Isaac in Genesis 22, which was subsequently identified with the Temple Mount in Jerusalem. Importantly, the guidebook identifies only a part of the Temple Mounts as being within Al-Aqsa Mosque. "Unveiling" shows that, since 1967, Palestinians have increasingly tried to build up their claims and belittle Israelis' by physically obliterating archaeological evidence of Jewish history. As the movie describes, the waqf controlling the Muslim compound brought in bulldozers in 1999 to dig a pit on the Temple Mount, and simply threw out the debris without making any effort determine whether it contained anything of historical value. Such evaluations are standard in construction projects in many places where there is much less reason to believe anything of historical value exists. As the movie documents, there is a silver lining here. "We're digging in the mud they threw out, dumped in a garbage site," explains Israeli archaeologist Assaf Avraham. Israelis searched the debris and found a treasure trove of Temple artifacts they otherwise wouldn't have been able to access. For instance, they found Roman tiles from the Herodian Temple complex, and the base of a column from the Herodian Temple. In contrast to its centrality to Jews, in Muslim history the site's importance was most limited. Despite the construction of the Dome of the Rock and Al-Aqsa Mosque, the area held little importance until Palestinian claims after the Six Day War. The British called it a dump when they arrived during World War I. Pictures of the Temple Mount from the period of Jordanian control (1948-1967) show a neglected site overgrown with weeds. No Muslim leaders (other than Jordan's King Abdullah I, to his sorrow) visited Jerusalem. Meanwhile, Jews were not permitted either to live in the Arab part of Jerusalem, or visit to pray at the Western Wall. The Jewish cemetery on Mount of Olives was desecrated. Rehov intersperses interviews with Palestinians including Shaykh Omar Awadallah Kiswani, Director of Al-Aqsa Mosque, Yussuf Natsheh, Director of Islamist Archaeology for the Waqf (the Islamic trust that administers the Temple Mount compound), and the unnamed Imam of Al-Aqsa Mosque. All deny the importance of the Haram to Jews and Christians and reject their historical claims to the site. Rehov's success in convincing them to be interviewed for his film is an extraordinary achievement, especially given that his movie is one long debunking of their denials. The speakers talk in a very calm and low-key manner. Jarringly, the film incorporates clips of Mahmoud Abbas endorsing bloodshed to vindicate Muslim claims and rioting by Palestinian stone-throwing youths. Essentially, the movie is a plea for Arabs to accept co-existence. Rehov's strategy is to show that Muslim refusal to accept the validity of other claims to the Temple Mount – the same refusal embodied in last year's resolution – is an obstacle to peace, and perhaps the main one. The Temple Mount becomes a metaphor for Jerusalem, which serves as a metaphor for the entire land of Israel/Palestine. In contrast to the popular media and political perception blaming Israeli "intransigence" for the absence of peace, Rehov shows that on a more fundamental level, Palestinians lack the willingness to compromise their claims and so share the Temple Mount, the city, or the country. As legal scholar Shmuel Berkovitz says, "I respect their mosque. I respect their belief. Please, respect our beliefs as Jews..."
Rehov's film isn't likely to change the minds of Palestinians or their Muslim supporters. The same mindset that throws thousands of years of Jewish history into a garbage dump is unlikely to be persuaded by findings about that history. More likely, Rehov is targeting people of the Christian nations like the ones that abstained from the UNESCO vote. Whereas veiling has positive connotations in Jewish tradition, and certainly in contemporary Islam, it has negative connotations in Christianity. In Christian tradition, the veil before the Temple's holy of holies ripped upon Jesus' death, thus emphasizing that God was accessible to all. Judging by Rehov's choice of title, it is Christians he most hopes to persuade. Hopefully, his case combining hard facts with Christian history will succeed in making an impact. Johanna Markind is an attorney who writes about radical Islam, anti-Semitism, criminal law, and other subjects. She previously worked for the U.S. Department of Justice and the Middle East Forum.